Only four players have a maximum 2 points after the second round of this year’s Calderdale Individual Chess Championship. Photo used under Creative Commons terms and sourced from bicouni’s Flickr photo stream. 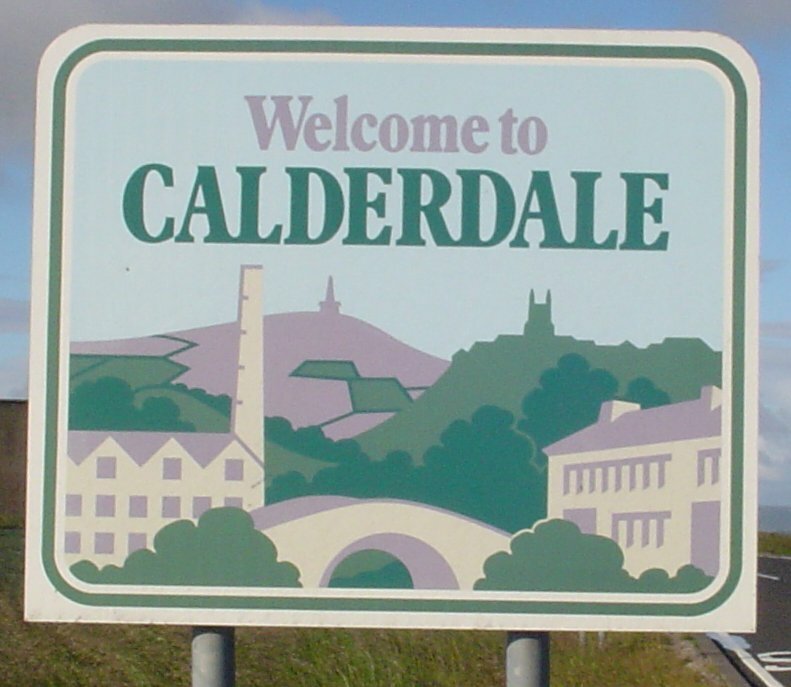 After the turbulence of the first round a relatively normal service was resumed in Round 2 of the Calderdale Individual Championship as the higher rated players generally re-asserted their dominance. That wasn’t to say that there weren’t any surprises though. A couple of the underdogs put up stern resistance and manage to draw their games against top seeds. 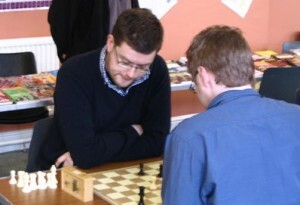 With the champions from the last four seasons (and also the top two seeds), Matthew Parsons (Hebden Bridge) and Greg Eagleton (Huddersfield), having only managed draws in round 1, there was an opportunity for some of their challengers to maintain a half point advantage if they could manage to win again in the second round. The first surprise of the evening happened before play had even started as the third seed, Mitchell Burke (Huddersfield) did not show up and appeared not to have informed the arbiter, John Kerrane, early enough in advance of the round to be eligible for a half point bye. We will await to see whether or not Mitchell will be given a half point. In any case, Mitchell’s absence meant that the draw had to be carried out again from scratch so the start of the round was delayed. Once proceedings were underway it was clear that the cohort of Hebden Bridge’s junior players, all relishing the opportunity to play against more experienced opposition, where going to have a difficult evening. All eight of the juniors lost in the end and they put up varying degrees of resistance. Owen Buchan (Hebden Bridge) faced the toughest proposition as he’d taken a half point bye in round 1 and was then drawn to face reigning champion Greg Eagleton in round 2. Owen quite sensibly chose to play a 2.c3 Sicilian line rather than wade into some theoretical debate and he succeeded in playing some interesting and unusual moves and maintained the material balance but failed to get his king to safety and was gradually out-manoeuvred until Greg broke through on move 21 to threaten mate. Martha Leggett (Hebden Bridge) was unfortunate enough to have been the extra player in the draw in round 1. The up-side was that she got a full point. The downside was that she now faced another experienced player with half a point to his name Belgrave’s Angel Gonzalez. She also put up good resistance with some sensible play in the opening but slowly it all unraveled and Angel’s experience showed through. The other junior who showed good fighting spirit was Luca Curry (Hebden Bridge) who took on Pete Leonard (Hebden Bridge) one of the surprise losers in round 1. This was a game of hanging pawns for, while Luca kept his pieces on the board he slowly lost one pawn and then another until Pete had reached a single rook and pawns ending where he had four (!) extra pawns. Luca realized that the game was up at this stage but he had at least managed to reach an ending. Finally, Toby Dodd also put up firm resistance against Steve Harrington (Belgrave) in an encounter that didn’t have the same gap in rating between the two players as some of the others and was therefore rather more protracted. The remaining four Hebden Bridge juniors, Gwillem Hughes, Alfie Dermo, Julia Hadari and her brother Joel were unfortunately put to the sword in rather more summary and swift fashion by Robert Sutcliffe (Huddersfield), Vivienne Webster (Halifax), Neil Bamford (Hebden Bridge) and Adrian Dawson (Belgrave) respectively. In the next round some of the juniors will inevitably start to get drawn against each other and this should begin the process of deciding which of them will win the junior prize in the tournament. Hopefully they are also learning and getting valuable experience from these games played against adult opposition. Now let’s look further up the draw. The other high-profile victim of round 1 (besides Pete Leonard) was Richard Porter (Halifax). He bounced back with a win in positional style over Bill Joyce (Todmorden). Top seed Matthew Parsons won in similar fashion against Daniel Rivron (Halifax) and Andy Leatherbarrow (Hebden Bridge) capitalised on his excellent draw with Matthew in round 1 by beating Michael Tait (Halifax) to advance to 1½. That just leaves us with the remaining twelve players (aside from Mitchell Burke) who had won in round 1 to cover. With Mitchell out of the draw they were all neatly paired against each. On board 1 Martin Syrett (Hebden Bridge) was up against fourth seed Phil Cook (Todmorden). Martin can be a very dangerous player and has been on decent form this season but unfortunately, on this occasion, he suffered a major malfunction. 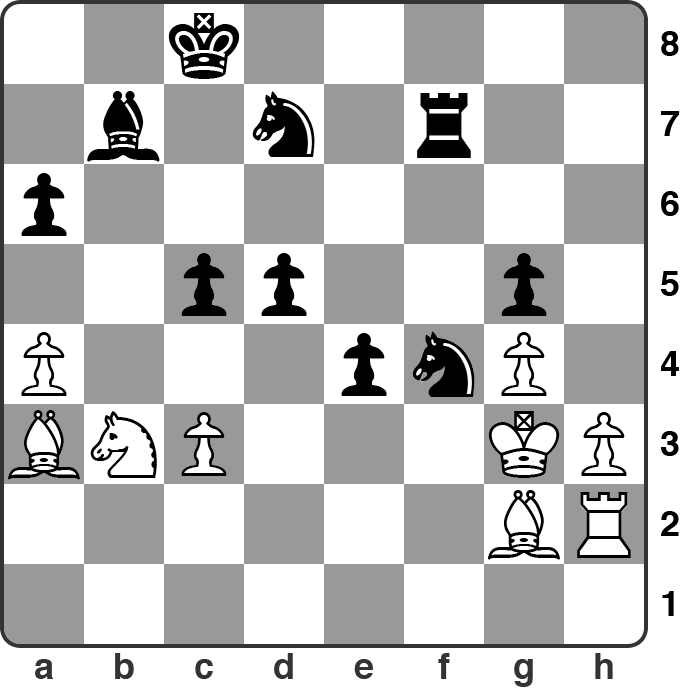 Having responded in typically ambitious fashion to Phil’s provocative opening play, Martin overlooked a tactic that gave his opponent a devastating counter-attack early in the middle game. The end was efficiently executed by Phil who compelled Martin’s resignation as early as move 21 and was the first player to reach 2/2 on the night. Not long afterwards Nick Sykes (Hebden Bridge) joined Phil on 2 as he took down one of the round 1 heroes, Pete Moss (Halifax), who had beat Richard Porter in fine style. Nick, as ever, was well versed in the opening that appeared on the board as play transposed from a King’s Indian Defence to a Maroczy Bind-type position but with some interesting nuances. Pete’s position gradually became more and more difficult until Nick was able to force a decisive breath through in the centre. He concluded the game with a nice tactic exploiting a pin on the d-file and a knight fork on c7. It was rather later in the evening before anyone else was able to make it to the perfect score. On board 4, Dave Shapland (Hebden Bridge) faced John Brooke (Belgrave) and played energetically to set up a strong attack and put his opponent under great pressure. Dave won a piece and then another. John soldiered on but he had no counter play and was eventually forced to resign in a hopeless situation just after the players had reached time control. Interestingly, only one more player was able to join the three now on 2 points. On board 2 fifth seed Ian Hunter (Belgrave) seemed in danger of losing to super-solid Scott Gornall (Halifax) at one point but in the end an acute time-shortage for Scott enabled Ian to escape with a draw which was the least he deserved for his efforts. The sixth seed John Allan (Hebden Bridge) also faltered against Mike Barnett (Belgrave). Mike is a tough player to beat with Black and John didn’t manage to create any sort of complications or imbalance in the game and as a result the two chopped wood until they reached a same-coloured bishop and pawns ending which was only ever going to be a draw. The last game of the evening to finish did finally produce a fourth player to make it to 2 points. Richard Bedford (Todmorden) took his time but did convincingly outplay Barry Wadsworth (Halifax) who put up stiff resistance but was already losing by the time he blundered both his remaining pieces in terrible time trouble at the very end of the evening. The full list of individual results and standings after round 2 are given below. Some of the games from round 2 can be found in the game viewer at the end of this post. 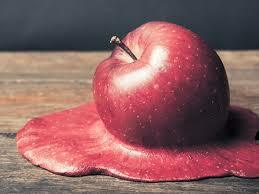 I couldn’t find a picture of an applecart actually being upset so this will have to do! At least it reflects the meltdowns some of the higher rated players had in round 1 of the Calderdale Individual Chess Championships last Monday. The first round of the Calderdale Individual Chess Championship is typically a relatively turgid affair. The draw for the opening round pits the top half of the draw against the bottom half and, with only one section in the event, you tend to see the kind of grading differences between opponents that tends to lead to a clean sweep for the favorites. Occasionally the odd half point is saved and very occasionally a top dog makes a blunder from which it is impossible to recover. But in recent year’s this has been a rare event. However, it appears that the underdogs in round 1 of this year’s championship had not read the script as we were treated to a fascinating evening full of surprise and upset. But before we get to the action, lets briefly recite the cast of characters in this drama. 38 players registered to enter which represents a very good turn-out, although immediately 5 of those 38 took a half point bye in round 1. Unfortunately, that left young Martha Leggett without an opponent in round 1. Top seed in the draw was the champion of 2013, 2014 and 2015, Matthew Parsons (Hebden Bridge) who made his return after missing last year’s competition. In round 1 he was drawn to face club colleague Andy Leatherbarrow with Black pieces. Defending champion Greg Eagleton (Huddersfield) was seeded second and found himself playing with the White pieces against Angel Gonzalez (Belgrave). The top two are both rated well into the 180’s and their opponents on Monday were rated more than 50 points lower than them. The next 4 seeds in the draw are all rated in the 170s. Mitchell Burke (Huddersfield), Phil Cook (Todmorden), Ian Hunter (Belgrave) and John Allan (Hebden Bridge) had a slightly smaller grade advantage on paper but it still looked overwhelming like the top boards would result in a clean sweep for the top seeds. After this top half dozen we then had Richard Porter (Halifax), Dave Shapland, Pete Leonard, John Lavan and Nick Sykes (all Hebden Bridge), Richard Bedford (Todmorden) and Martin Syrett (Hebden Bridge) all rated between 140 and 169 (but mostly at the lower end of that scale). They too enjoyed grading differentials of between 40 and 50 points over their opponents. As ever there was an excellent showing from the Hebden Bridge junior club who fielded 8 players all of whom were taking the opportunity to test themselves against more seasoned players from the league and compete for the ’Best Junior’ prize. Now, to the action. Early on in the evening there didn’t appear to be much evidence to suggest any apple carts would be upset. Pretty much the first to win his game was Nick Sykes who quickly dealt with Bill Joyce (Todmorden) on board 11. On board 6 John Allan won smoothly against Adrian Dawson (Belgrave) after dealing effectively with Adrian’s pet opening, the Lowenthal Variation of the Sicilian Defence. Likewise, Ian Hunter defeated Neil Bamford (Hebden Bridge) in similarly prosaic fashion. Both Phil Cook (against Vivienne Webster) and Mitchell Burke (against Robert Sutcliffe) had to work a little bit harder to get the better of their adversaries but they did so in due course. At the lower end of the draw there were also some quick victories as some of the juniors found themselves with too much to do against more experienced opponents. John Brooke (Belgrave) had finished his game against Julia Hadari (Hebden Bridge) pretty quickly and Scott Gornall (Halifax) also dealt with young Alfie Dermo (Hebden Bridge) in short order. Soon after the youngsters were joined in defeat by Gwillem Hughes (Hebden Bridge) who went down to Martin Syrett and Joel Hadari (Hebden Bridge) who lost to Mike Barnett (Belgrave). Of the junior contingent this just left Luca Curry battling it out with Richard Bedford beyond the half-way stage of the evening. Despite these early set-backs though, the battle for best junior in the tournament looks like it will be well contested. Beyond the mid-point of the evening the balance of power began to shift towards the underdogs. At first it was only a minor blip as Andy Leatherbarrow (who has been having an outstanding season so far) managed to hold a draw without too many problems against the top seed on board 1. It was perhaps a greater surprise when Angel Gonzalez also held a draw against the reigning champion, mainly because he did so with Black. This was how the bottom half of the draw got off the mark. By this point of the evening it was becoming clear that some of their number were playing well enough to have very good winning chances. On board 7 Richard Porter seemed to have secured a perfectly good position against Pete Moss (Halifax) but then he over looked an exchange sacrifice that brought about a huge attack for White. There didn’t seem to be an immediate break through, and Richard defended tenaciously, but his position looked abject. Next door on board 8, Dave Shapland was struggling with White against Terry Sullivan. 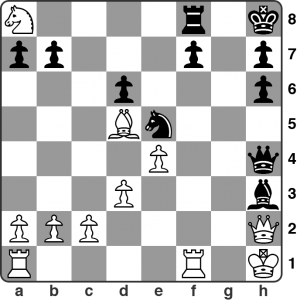 Terry played carefully and accurately (although also slowly) in the opening phase of the game and Dave didn’t manage to get any kind of attack going in a Rubenstein Variation of the French Defence. Finally, Dave took too much of a risk in keeping the queens on the board when Terry offered their exchange and suddenly Black was in the ascendency which led to Terry also winning an exchange and maintaining the initiative to boot. The next two boards were also looking interesting. Pete Leonard had gained a very pleasant position from the opening against Barry Wadsworth but then started to misplay the position and Barry, never one to decline the opportunity to attack, did just that was hanging on and started to turn the tables. John Lavan was also up against it in his game with Steve Harrington who was going for it with Black and putting his higher rated opponent under serious pressure. In the end a couple of the stronger players had to rely on the clock to haul themselves to safety. Dave Shapland was in serious trouble but Terry, having played very deliberately earlier in the evening, didn’t seem able to raise the tempo of his game as time control loomed and allowed his clock to run down with six moves still to make. Dave let out a massive sigh of relief! Steve Harrington’s brave effort also came to nought during the time scramble which, if the score sheet is correct seems to have involved both players over-looking a mate in 1 for White towards the end of the game. In the end, John navigated through the complexities to gain material and Steve also ran out of time. By this point in the evening Richard ‘Beaky’ Bedford had also overcome the spirited resistance of Luca Curry which ensured that the juniors drew a blank in round 1. No doubt they will begin to pick up some points in round 2. This just left the two major upsets of the evening to play themselves out. First of all Pete Leonard went completely off the rails against Barry Wadsworth. He lost a pawn and then a piece and was in desperate time trouble to boot! In the end he felt compelled to resign soon after the time control as the queens were about to come off leaving Barry with an extra knight and two pawns in the end game. Pete Moss’s victory came about in rather different style. Having kept his boot metaphorically on Richard Porter’s throat he slowly lost some of his control but then, just as it seemed Richard might somehow salvage something from the game, he blundered a rook and resigned on the spot. A fitting outcome for Pete’s earlier fine play. Richard was the first to congratulate his opponent and as they chatted afterwards it emerged that they had played each other before at primary school 46 years previously!! We didn’t find out who won that game but Pete left no questions about this one. Round 2 takes place on Monday 5th of December. Will some of the successful underdogs be able to continue showing their fine form? Before we say “Goodbye” to 2014 let’s have a last look back at the chess year from a Hebden Bridge perspective. I’m going to make this a two part story (with the second half coming later in the week) and intersperse some positions from games played by Calderdale players (mostly Hebden Bridge players of course). If you feel like testing yourself with some of these positions as puzzles then you can. Alternatively if you’d like to re-live these games again in full then they are collected in the viewer at the end of this post. January: Parsons vs. Broadbent — Calderdale League 1. 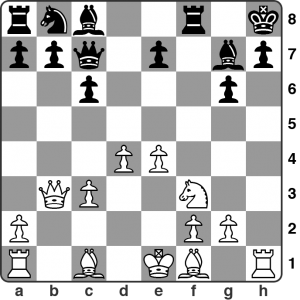 Black has just played 11…fxg6. 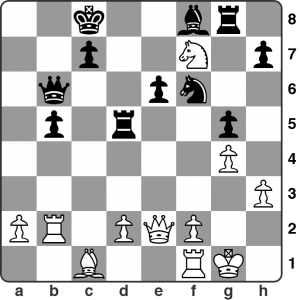 White has a significant advantage but how should he proceed? Should he go for 12.Ng5, 12.Nh4, or something else? The solution is in the game viewer at the end of this post. 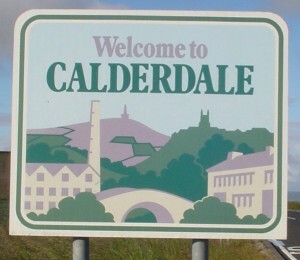 Let’s start by recollecting the tremendously exciting Calderdale League 1 title race. Of course Hebden Bridge ‘A’ started the season as champions but they knew right from the off that they would struggle to retain the title as Huddersfield, Courier ‘A’, Todmorden ‘A’ and Halifax ‘A’ all strengthened their line ups during the 2013 summer break. Despite a very strong start that saw the champions defeat both Todmorden ‘A’ and Halifax ‘A’ before Christmas, they subsided in the December and January period with a string of disappointing results. Hebden were realistically out of the title race by the time 2014 had reached the end of its first month but the team did rally strongly towards the end of the season as they sprung a huge 1 — 4 away win on their arch-rivals Huddersfield. They ended the season respectably placed in mid-table, well clear of the relegation zone. Sadly for HebdenBridge ‘B’, the season was extremely tough as they struggled to field a full team on numerous occasions and were out graded in most of the matches they played. Relegation was always the likely outcome for them but, despite the hardships, they did manage very creditable draws with their own ‘A’ team and Todmorden ‘B’ as well as taking a victory from their home match with Brighouse. April: Tooley vs. Shapland — Calderdale League 1. 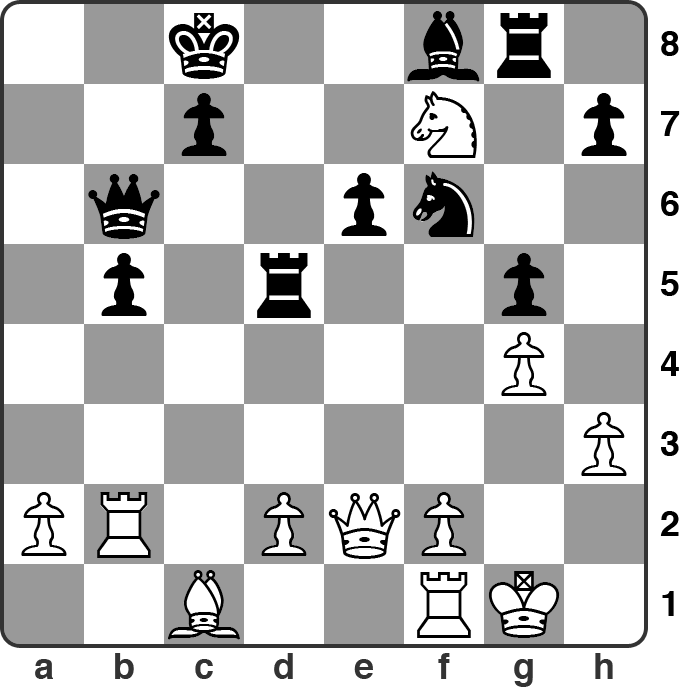 White has just played 22.Qa3 and in the game Black replied by sacrificing his rook on f2. Is this sound? Try and calculate all of the critical lines. See game viewer for the solution. Of course the title race was very competitive indeed and came down to a four-hourse race between the aforementioned Couier ‘A’, Halifax ‘A’, Huddersfield and Todmorden ‘A’ outfits. Huddersfield looked to have the title in the bag with two rounds to play but they were derailed by HebdenBridge ‘A’ in the penultimate fixture and this allowed Halifax to take the driving seat. In round 14 they needed to beat Courier ‘A’ in a winner-takes-all encounter, whilst Huddersfield travelled to Todmorden knowing that they had an outside chance if they could win there. In the end Huddersfield slumped to another defeat and Halifax edged it against Courier to take their first title for 28 years! Looking at Hebden Bridge’s individual scores in league 1, Dave Shapland was the highest scorer for HebdenBridge ‘A’ with 8½/11 playing predominantly on boards 4 and 5. Pete Leonard, Matthew Parsons and Andy Bak all managed at least 50% and Matthew Webb guest starred in the two matches against Todmorden ‘A’ scoring wins against Martin Hamer on both occasions. The ‘B’ team naturally struggled individually but their captain Martin Syrett scored an extremely creditable 5½/10 playing largely on the upper boards. April: Syrett vs. Webster — Calderdale League 1. This was a really crazy game! Black, having just played 17… Bh3 is threatening to play Ng4 next move. This looks dangerous. How should White respond? Solution in the game viewer below. League 2 was depleted by the loss of Todemorden’s ‘D’ team right at the outset of the season and that meant that just seven teams competed for the title. In the end most people’s favorites Belgrave won the league with a score of 21 points. Halifax ‘B’ finished in second place with 19 and Todmorden ‘C’ were third with 16 points. Like Hebden Bridge ‘B’ the Hebden teams in League 2 also struggled to raise full line ups from time to time as the club’s membership of active league participants dwindled. Certainly the ‘C’ team were not contenders for promotion as they have been in previous years. In the end Hebden ‘C’ were fifth with 9 points and Hebden ‘D’ finished bottom with 2 points. But what a glorious 2 points they were! Surely the outstanding team performance anywhere in Calderdale (perhaps even anywhere in Yorkshire) in 2014 has to be our ‘D’ team’s mind-blowing win over the eventual champions Belgrave. It happened at the Trades Club on February the 17th as Danny Crampton’s ‘development’ squad took on an unbeaten Belgrave line up that out-rated most of their Hebden ‘D’ adversaries by 80 points or more. From the off the ‘D’ team put up spirited resistance but none of the players or spectators expected anything other than a comprehensive win for the visitors. However, it didn’t work out that way as Captain Crampton on board 1, Karl Dickinson on board 2 and Dylan Leggett on board 4 all beat seasoned campaigners rated far, far above them as the ‘D’ took a famous match 3 – 2 and condemned Belgrave to their only defeat of the season. Check this out for a score card. The ratings of each player at the time the match was played are given in brackets. From an individuals perspective, the Hebden teams in League 2 all had a very tough season. Only John Kerrane and Neil Bamford could manage 50% for the ‘C’ team which was symptomatic of their travails and none of the ‘D’ team managed 50% even though those three musketeers from that match in February all grew their year-end ratings as a result of their deeds! February: Ursal vs. Burke — Calderdale Individual R4. Black’s just played 45… Rg8 and White, in time trouble, missed his chance to win the game. How should he have proceeded? Hebden Bridge’s Matthew Parsons retained his Calderdale Individual title in March as, after drawing in the first round with Martin Syrett in November, he beat his ‘A’ team colleagues Messrs Leatherbarrow, Shapland, Leonard and Sykes to lift the trophy ahead of a strong field that included Todmorden’s Pete Mulleady, Halifax’s Darwin Ursal (who finished second on 4 points) and Huddersfield’s Mitchell Burke. All in all the tournament was a little bit disappointing as a spectacle mainly due to the vast majority of entries coming from Hebden Bridge players. This tended to lend the competition the air of a club championship plus some special guests rather than a highly competitive tournament comprising the best players from across Calderdale duking it out for the area’s premium individual title. Nevertheless there were some memorable highlights aside from Matthew’s impressive form. 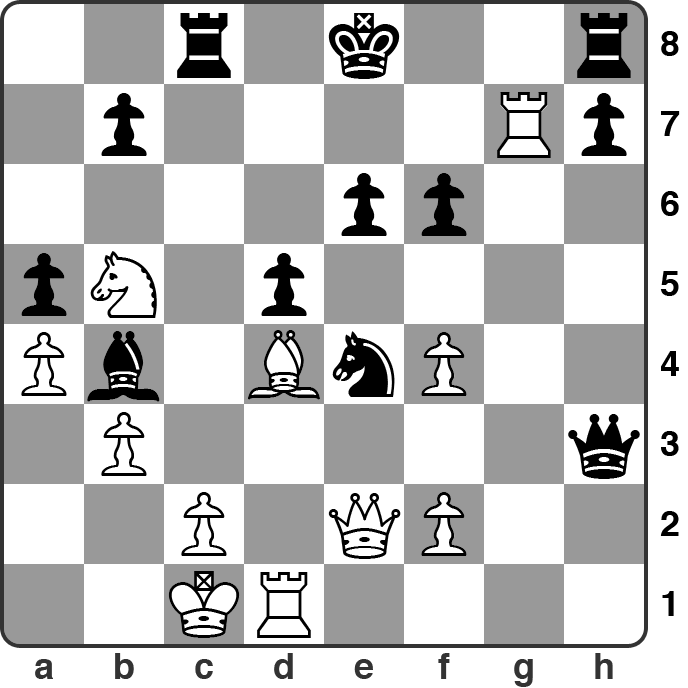 In the first round John Kerrane played extremely well against the top seed, Mitchell Burke and actually missed a mate in one that would have given him one of the best wins of his life. Breathing a huge sigh of relief Mitchell scraped through to win that game in the end. In February’s fourth round the Huddersfield board 1 was once again involved in the game of the night as he faced former champion Darwin Ursal with the Black pieces. 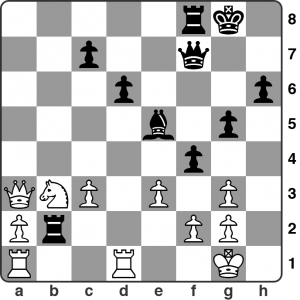 Knowing that he needed to win to stay in touch with Matthew, Darwin threw the kitchen sink at his rival in a very sharp King’s Indian Defence and both players got into desperate time trouble as they strove to navigate their way through the complexities of the position. Eventually they agreed to a draw with only moments left on their clocks and a crowd of kibitzers straining to see what was happening at the board. March: Shapland vs Leatherbarrow – Calderdale Individual Championship R5. 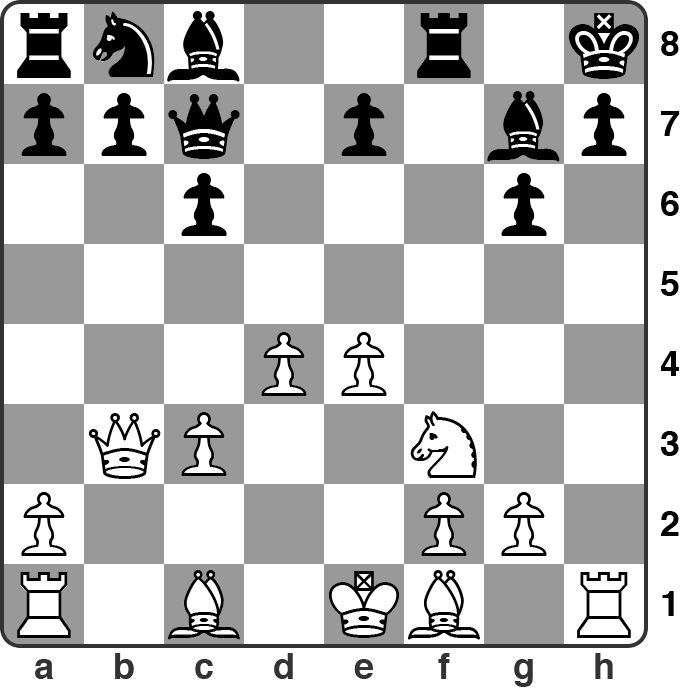 It’s White to move. The position is a mess and there are weaknesses everywhere on both sides. Black has just played 20…g5. 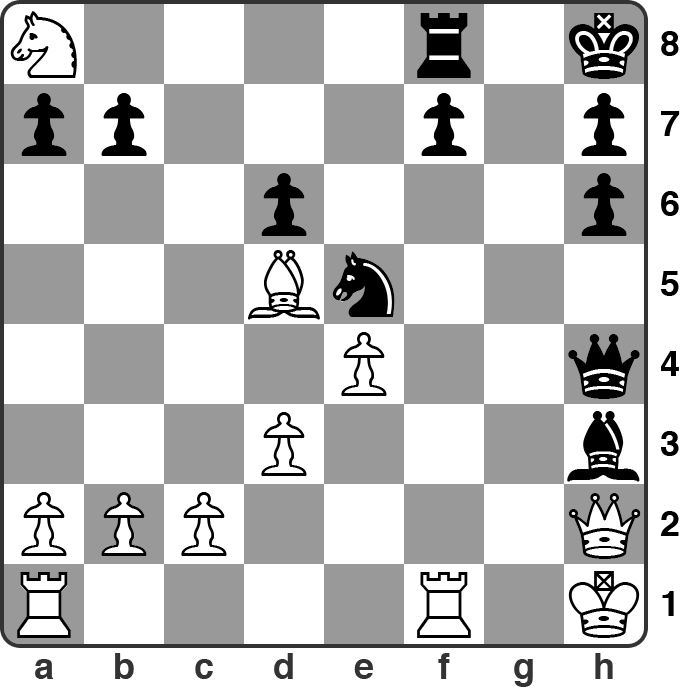 What’s White’s best approach here? 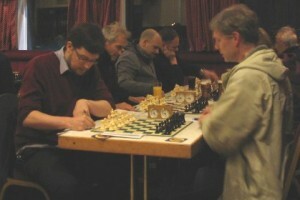 When the final round took place in March the tournament leader dispatched the last of his ‘A’ team colleagues (in the form of Nick Sykes) to retain his title. However, this was far from a smooth victory as Nick got a perfectly playable game from the opening and Matthew felt compelled to venture a risky exchange sacrifice to unbalance the position in search of the victory he needed to guarantee first place. It looked like Nick would at least hang on for a draw in the endgame but Matthew set up a cunning mating net and Nick stumbled into it. Meanwhile, further down the board order Dave Shapland and Andy Leatherbarrow were engaged in a game that showed all the hallmarks of two participants who no longer had anything to play for in the competition. They contrived to create a game of huge complexity with sacrifices offered and declined and the tension almost unbearable. Eventually Dave ran out the winner and this result gave him a share of third place alongside Nick Sykes and Martin Syrett on 3½/5 behind Matthew and Darwin. Hebden Bridge ‘A’ made some amends for losing their League 1 title by powering to victory in the Team Lightning competition which took place at the Belgrave Social Club in May. Although only six teams were entered Hebden still faced formidable opposition in the form of the reigning champions Huddersfield who had wheeled out a ferocious line up to defend the trophy. The crunch match up came as early as round 2 when Hebden ‘A’ faced the holders and, despite being out-rated on every board, they scored a tremendous 4 – 1 victory. This paved the way to their success as they scored 22½/25 with Huddersfield finishing a distant four points behind. The Hebden Bridge line up of Matthew Parsons, Andy Bak, Pete Leonard, Dave Shapland and Nick Sykes also collected four of the five individual board prizes and Hebden Bridge ‘B’s Karl Dickinson won the junior prize. A number of Hebden Bridge players represented Calderdale ‘B’ in Yorkshire League Division 2. After a very promising start to the season with three consecutive victories the team ran out of steam and were only sure of safety from ignominious relegation when they rallied to two more wins in March. They finished 8th out of 12 with five wins and six defeats. Not a bad return in the end. One of Calderdale ‘B’s best performers (scoring 6/7 at 86%) was Hebden’s John Allan. He only played a handful of evening league matches as he much prefers to play his chess in the daytime. On this evidence one can understand why. Hopefully he’ll continue to be available and successful for the side this year. Andy Leatherbarrow was often wheeled out on the higher boards against very strong opposition and so his record of seven draws and three defeats was by no means a poor one. Martin Syrett also featured frequently though he had less success here than he did in the evening leagues and Calderdale Individual. There were no Hebden players in the Calderdale ‘A’ team this season but they distinguished themselves once again in League Division 1 by finishing with a 50% record and in 6th place out of 12. In the game viewer below you’ll find the complete games featured in the positions above (some with commentary) so you can see how you got on with the puzzles. I’ll be posting the second half of this article early in the new year when I’ll be focusing on the second half of 2014. Until then I’d like to wish all our members and readers a very happy new year! Reports of its death are greatly exaggerated! Last year’s Champion retained his Calderdale Individual Championship at the Trades Club on Monday night. Congratulations to Matthew on this significant achievement! Darwin Ursal of Halifax was 2nd and the grading prizes were won by Nick Sykes, Martin Syrett, Angel Gonzalez and Alex Brown. You can read a full report of how the round proceeded, see the full final standings and play through the games from round 5 over on the Yorkshire Chess website but I’ll also publish the games here later today in our game viewer for those who prefer it. Matthew Parsons (left) is the reigning Calderdale Champion and is set to retain his title unless Nick Sykes can stop him on round 5 on Monday. The fifth and final round of this year’s individual championship takes place at the Trades Club on Monday (the 10th). Hebden team mates Matthew Parsons and Nick Sykes will be slugging it out for the honours. I’ve just posted a report of the round 4 action and all the games (except one) on the Yorkshire Chess website. For some reason the game Leonard vs. Parsons just wouldn’t load into the Chess Microbase so I’m adding it to this page in the game viewer below (along with all the others from round 4) for completeness. Good luck to both Matthew and Nick in the final round. May the best man win! No prizes for spotting the move John missed. It’s pretty straightforward if you know that there is a mate there to look for. 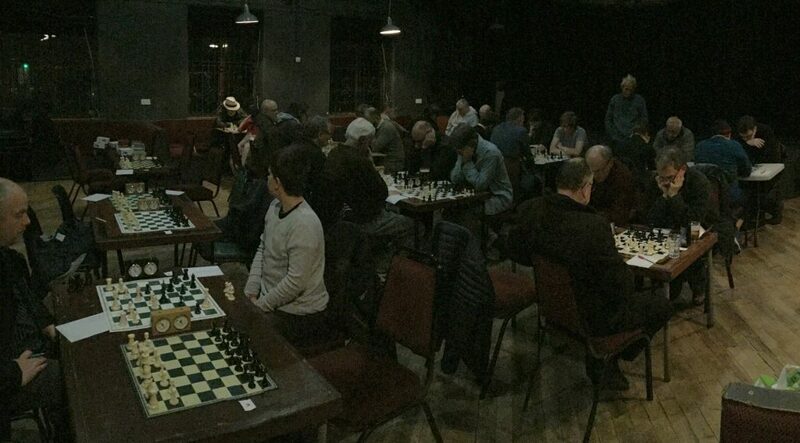 A report on round 1 of the Calderdale Individual Championship has been posted on the Yorkshire Chess website. Our headline of course refers to Joseph Blackburne’s famous quote about checking all checks. Unfortunately one of the most significant stories of the round was John Kerrane overlooking a mate in 1 against the top seed Mitchell Burke which would have been a really amazing result for him. The competition will be held at Hebden Bridge Trades Club, Holme Street, Hebden Bridge. HX7 8EE. 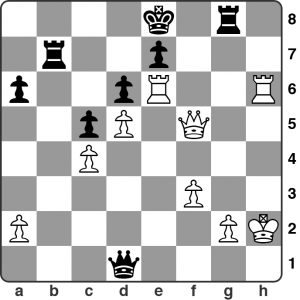 You can only enter if you are a member of a Calderdale chess club at Sunday 10 November 2013. This means that the League’s website has you registered with a club, with a League grade, by this date. League grades will be used for this competition. The entry fee is £3.50 or £2.50 for juniors (under 16). Your entry fee should be paid to the controller on Monday 11 November before the first round begins. Pairings will be displayed shortly after 19:30 and each round will start at 19:45. Re-pairings will be made at 20:15. If a competitor fails to arrive by 20:15 he/she will be deemed to have withdrawn from the competition. Winner: £25. The winner also holds the Timeform Trophy for one year. Grading prizes: £10 each, dependent upon entry. 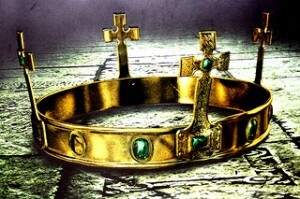 Cash prizes will be awarded after the fifth round. The Timeform Trophy will be awarded at the season’s end. The time limit is 36 moves in 75 minutes. For re-paired games the time limit is 30 moves in 60 minutes. After this each clock will be set back 15 minutes and the game must be completed in the time remaining. If a competitor is unable to play in a round, he may take a bye provided that the controller is notified at least 24 hours before the round is due to begin. A half-point bye can be taken in any one of the first four rounds. 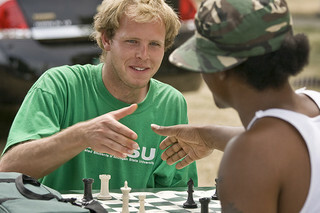 Each competitor can take only one half-point bye during the competition. In the event of a tie for winner or runner-up, the positions will be decided by progressive scores. 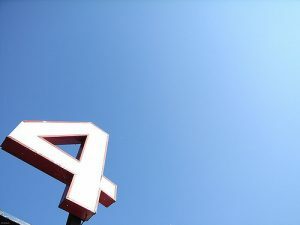 If there is still no clear winner or runner-up, opponents’ grades or opponents’ scores may be used as further tie-breaks. Duplicated score sheets will be made available. Each competitor must give one copy to the controller at the end of each round with the game’s result clearly shown. Mobile phones must be turned off/ silent. Your phone ringing during the playing of your game is deemed to be a resignation. Please take empty glasses back to the bar and respect our hosts. Win lose or draw, enjoy the competition.